Peter Frampton was one of those people destined to be a musician. As a youngster, music pulled him in; he took piano and guitar lessons and joined his first band by the age of twelve. David Bowie attended the same school as Frampton and at one time, the unknown musicians appeared on the same bill at a school event. How weird is that? It wouldn't be the last time they played on the same stage. By the age of sixteen, Peter's face graced the cover of the British teen magazine, Rave, as "the face of 1968." Soon he was working with the groups Herd and Humble Pie. That's pretty impressive for someone who hadn't yet peaked. And yet, I didn't know much about him at that time. That soon changed because when I was in high school, Frampton came alive. Released in 1976, Frampton Comes Alive! is one of the top selling live records of all time. There were four previous albums, but it was this fifth album that really caught everyone's attention. Notice how I feel free to speak for everyone. Name any major rock artist and there's a good chance that Framptom worked with them, in one form or another. George Harrison? Check. Jerry Lee Lewis? Check. David Bowie, Harry Nilsson, Ringo Starr, the Bee Gees...must I go on? With this track record, I can forgive his onscreen presence in the movie Sargent Pepper's Lonely Hearts Club Band (and remember, I'm a huge Beatles fan...so that says something when I give SPLHCB a big thumbs down). He had a nice little cameo in Almost Famous that made me smile. Peter Frampton has never stopped playing and performing, really. There were highs and lows, but he has too much talent to keep down. Last year, he released his 17th album, Hummingbird. What does this guy eat for breakfast and how does he do it? Click on the banner above to see the full list. >>... "What does this guy eat for breakfast and how does he do it?" He eats Wheaties, and he does it through... two straws. When you admitted that one of my F guesses was right, but it wasn't Fleetwood Mac, there was ZERO doubt in my mind that Frampton was the right answer. I think I'm the ONLY person who graduated from high school in the U.S. during the years 1975-1977 who DID NOT buy a copy of 'Frampton Comes Alive'. I've never been able to figure out WHY I didn't buy it. I liked those two big hit songs, and I bought LOTS of LPs back in those years. Why I never acquired 'Frampton Comes Alive' has always been a 'Mystery To Me'. ...Oops. Look at that... I've gone back to Fleetwood Mac already. CHERDO, I'm not going to try to guess ahead anymore because it takes the fun out of it for you and me. Having said that... "G Is for Grand Funk Railroad, Golden Earring, Gibb Brothers (gibb me 3 more milkshakes if that's true), or G. Gordon Liddy". 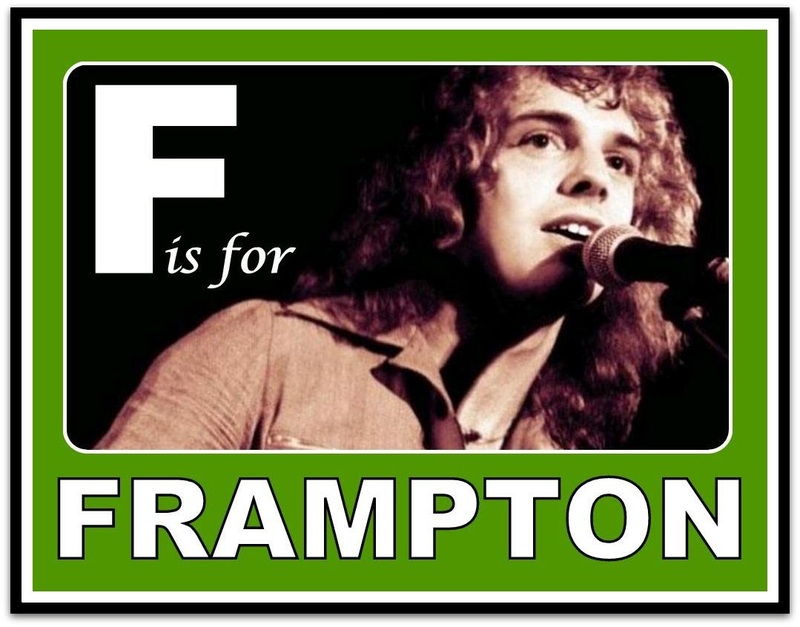 ~ "G Is For GgoDsneF-D"
"Frampton Comes Alive" was one of those albums where everyone knew every song and played it like it was a religion. Luckily, I liked it. It could have been Barry Manilow's album that spun off "Mandy" that the album-religion required....oh, wait, they played that to death, too. I'll put the milkshakes in the fridge and make a nice salad. Dressing of choice? I've never heard it. I only know a couple of the songs. If Stephen comes back and he will, he'd probably like to know that I interviewed G Gordon Liddy in college. Now I'll have to watch Almost Famous to see Frampton's cameo. It's also fascinating that he's worked with so many different artists. Now THAT is cool, Julie! I also met G. Gordon Liddy. He wrote a book while I worked at St. Martin's Press (obviously published by St. Martin's Press) and I remember coming in to work and there he was in one of the Senior Publicist's offices. It was called The Monkey Handlers. I never read the book, even though he signed a copy for me. Hahaha. I kind of recognised the name when I read your post title, but I had no idea who he was. I am terrible at names, so I never remember who made what song :) Thanks for linking to his music so I can try to commit it to memory :). There might be a quiz, Natasha (lol). Thanks for stopping by! A good choice for F. This is cool. It is I/me, air guitar rocker Shady Del Knight, named "The Farce of 2015" in the current issue of Tiger Beat. Going into today's post, Jimmy the Greek placed odds at 5 to 1 that a classic rock lover in your age range would pick Foreigner as your F music act. Eager to cash in on what I thought was a sure thing, I phoned my bookie, bet the whole nest egg and lost big time. Luckily I met a guy on a street corner who was willing to advance me the cash so that I can put it back in the bank before Mrs. Shady realizes it's missing. Life is good again! Disco: You either hate it... or you REALLY REALLY hate it. To be honest, I like Frampton's music, but I never bought any of his records. Instead, I quickly leapfrogged over mainstream soft rock acts like his and embraced Alice Cooper, Kiss, Aerosmith, Nugent ("Stranglehold"), Mountain ("Never in My Life") and other hair bands that packed more of a punch. Years later even those bands seemed too tame for me and I developed an appetite for harder and heavier forms of music. Must be a guy thing. Thank you very much, dear friend Cherdo! I think you hit the nail on the head. It is a guy thing because I know many a "guy" who had the same play list. Back in the day, I never really craved Aerosmith - but I loved Nugent. We played Scream Dream/Terminus El Dorado to death. I always found ole' Ted amusing on stage. That was as hard rock as I went. But I like other music, too...everything from the Flying Lizards to The Cure to Elvis Costello to classical and Broadway tunes...I'm pretty eclectic. Gotta scoot down the road, dear Shady! Go forth and have a great day! Minus the hair, but he still makes music today. And yes, I had that album. Yes, he still tours! I think he was out with Cheap Trick! He has bragging rights, for sure. Hence, the video! LOL. I'm sure there will be more strangers on the list. Frampton Comes Alive...truly the zenith of his career. It was what everyone in the senior class played. Wasn't he in that HORRIFIC Sgt Peppers movie with the Bee Gees? I never thought he was a looker; he looked okay. I was never a fan, probably because, back in the day, all of the chicks thought he was soooooo good looking. Jealousy is a terrible thing! Well you learn something new everyday. I'm watching 'Show Me the Way' and I hear the wawa sound but don't notice anyone doing anything to make it. Then I watch closer and notice that Frampton is playing a mouth harp attached to the mic. Never knew that. When I first saw this video (probably when it originally aired), that was the first thing I noticed. I didn't know what it was. That man was so hot, once upon a time. Now he is kind of old and bald--pretty much my speed. I didn't know he had a cameo in Almost Famous. I love that movie. Isn't it great that I reply to my own comments? I liked it when Lisa Bonet sang Oo Baby I Love Your Way in that John Cusack movie, the title of which I cannot recall at this moment. Jack Black is in it, and he's great. John Cusack is great. He's starting to get old, like Peter Frampton. And here I am, still sweet sixteen. If you like 'em old and bald, please call 1-888-SHADY. Peter Frampton was the first concert I had ever been to at the Lansing Civic Center. Now I'm jealous...I've never seen him in concert. Cherdo, thanks for posting your videos of the music with your nominees from the alphabet, as it helps me get them back in my mind.....now I'll have ear worms of the music for the rest of the day! I like the video links, too - and some people have no idea who these musicians are, so it helps introduce their music. That was the summer of our lives!!!!!! The only good thing to say about SPLHCB was Robin Gibb's take on Oh Darling. I forgot about that one. I always like Robin Gibbs unique voice - more than Barry, for sure. I like your music! But all I really remember of Frampton is that '76 album--and those long guitar solos. Good music! To me, that was the best album! I love Baby I Love Your Way. Such a great voice. There's a lot of talent packed in that little man. Live performance seals the deal on fan-dom, don't you think? Thanks for stopping by, Betty! Fleetwood Mac would have been a good one, too.